In a recent issue (Aug 12, 2010), the Economist magazine carried a special report on some of the path-breaking initiatives of the US and UK governments in harnessing social entrepreneurship in solving some of society’s most intractable problems. An excerpt is presented below. Why do the US and UK governments pay so much attention to and emphasis on social innovation? What do they really mean by social innovation? Will social innovation be able to address some of the most pressing problems of contemporary society? How relevant are the US and UK government initiatives for HK? Is the HKSAR government aware of developments like these in the world? What insights are there for the civic movement of social entrepreneurship in HK and China? POLICYMAKERS on both sides of the Atlantic are keen on a new approach to alleviating society’s troubles. On July 22nd Barack Obama’s administration listed the first 11 investments by its new Social Innovation Fund (SIF). 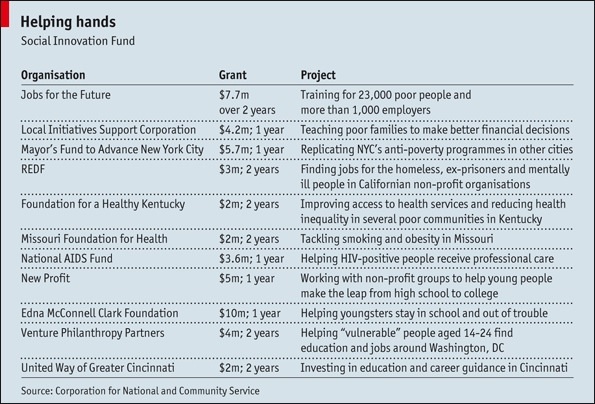 About $50m of public money, more than matched by $74m from philanthropic foundations, will be given to some of America’s most successful non-profit organisations, in order to expand their work in health care, in creating jobs and in supporting young people (see table). Although the SIF accounts for a tiny fraction of the federal budget, the fund embodies an approach that the administration plans to spread throughout government. 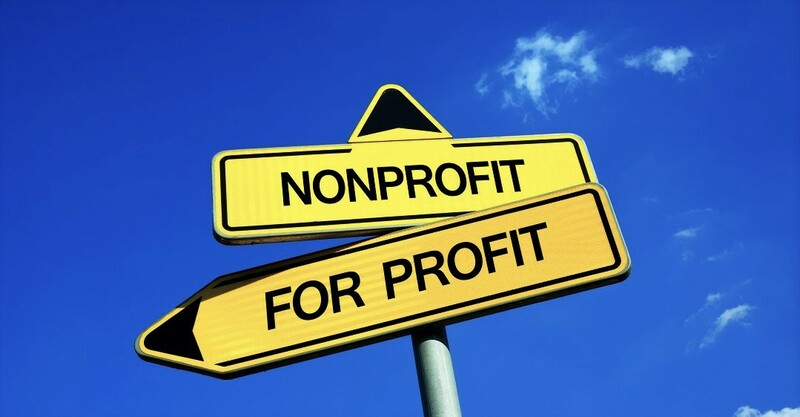 The fund is one of several efforts to promote new partnerships of government, private capital, social entrepreneurs and the public, pushed by the White House’s Office of Social Innovation and Civic Participation (OSICP), which Mr Obama created soon after taking office. These initiatives include another fund, i3 (for “investing in innovation”), in the Department of Education and cash prizes for novel answers to social problems. Three days earlier David Cameron, Britain’s prime minister, gave a speech in Liverpool outlining his vision of a “Big Society”. At its heart, he sees a similar partnership to Mr Obama’s. A Big Society Bank will “help finance social enterprises, charities and voluntary groups through intermediaries”, which sounds very like the task of the SIF. The government, said Mr Cameron, urgently needs to “open up public services to new providers like charities, social enterprises and private companies so we get more innovation, diversity and responsiveness to public need”. “Social innovation” is the increasingly common shorthand for this approach to public-private partnerships. It differs from the fashion in the past couple of decades for contracting out the delivery of public services to businesses and non-profit groups in order to cut costs, in that it aims to do more than save a few dollars or pounds — although that is part of its attraction. The idea is to transform the way public services are provided, by tapping the ingenuity of people in the private sector, especially social entrepreneurs. A social entrepreneur is, in essence, someone who develops an innovative answer to a social problem (for instance, a business model for helping to tackle poverty). A decade ago the term was scarcely heard; today everyone from London to Lagos wants to be one. Social-entrepreneurship conferences are invariably the best attended events for students at leading business schools. prize. Another prominent example is Wendy Kopp, the founder of Teach for America, which puts thousands of recent graduates from leading universities to work as teachers in some of the country’s worst schools. Politicians’ interest in social innovation has been sharpened by the rapid deterioration of governments’ finances. Even sustaining today’s public services out of taxes alone looks impossible. Fresh ideas that promise as much, or more, for less are welcome. “The silver lining in any economic crisis is that it can force government to take necessary steps that, in more comfortable times, would fall victim to inertia,” explains New York’s mayor, Michael Bloomberg in a foreword to a new book, “The Power of Social Innovation”. This book is a sort of bible of social innovation, full of examples of social entrepreneurs’ successes. It sets out both the potential of the partnership approach and the huge difficulties it will have to overcome. Its author, Stephen Goldsmith, is a Harvard professor, but his insights come from experience. As Republican mayor of Indianapolis, he won a reputation as a leader of a new breed of reform-minded American city bosses. His obsession with value for public money led him to fire 40% of the city’s non-uniform workers. sometimes made a big difference (as in Indianapolis), too often the partnerships were too prescriptive and highly focused on cost-cutting. In the fourth stage government will tap the ability of the private sector, for-profit and non-profit, to deliver “disruptive, transformative innovation”. The biggest obstacle in both America and Britain is likely to be the inertia of the bureaucratic, rule-bound public sector. “I can think of 1,000 innovations,” said Mr Goldsmith. “I have not yet had an innovative idea in any meeting that was legal.” Governments seem particularly bad at shifting money from old budgets to new ones. Every government agency should be required to put 1% of its budget into innovation funds, argues the Centre for American Progress, a think-tank with strong ties to the Obama administration. The Young Foundation has proposed the same policy in Britain.